New slipper clutch: Not only does the new slipper clutch help to prevent rear-wheel lockup on downshifts, it also reduces effort at the lever by almost half, helping to reduce rider fatigue particularly in city traffic or on long rides. More horsepower, more torque: The DOHC liquid-cooled parallel-twin engine uses a square bore & stroke of 67 mm x 66.8 mm for an optimum combination of strong low-end torque and excellent top-end power. A 4% boost in horsepower and torque for 2019 results in even sportier performance. Revised exhaust system: Improved airflow in the exhaust system—now featuring dual exit pipes—results in extra power and a sportier-sounding edge to the exhaust note. Maximized flow efficiency: In order to maximize air-intake and exhaust efficiency, the profile from the air cleaner through the intake ports to the exhaust pipe was made as straight as possible, helped in part by repositioning the battery away from the rear of the airbox intake duct. Small & light water pump: Careful flow analysis of the cooling system resulted in a water pump that's small and lightweight, yet still more than capable of keeping the engine running its best at high output levels. Reduced weight & friction: The four valves in each of the DOHC cylinder heads have narrow stems, thereby reducing weight and friction and increasing efficiency. High-tech design: A light and compact roller- rocker-arm assembly and shim-type valve adjustment allows a lower valve-spring load for reduced friction and a compact cylinder head. Improved durability: The pins in the silent cam chain have been treated with vanadium, which both reduces friction and improves durability. Lightweight pistons use an advanced manufacturing process for enhanced durability and performance. Reduced friction: The oil pump's internal relief structure uses the same design as found in the CBR1000RR, which reduces friction, improves aeration performance and simplifies the shape of the oil pan. Easy shifting: The new gear indicator and adjustable shift-up indicator make it even easier to use the smooth-shifting six-speed gearbox. "Excellent response & feedback ": The lightweight diamond-shaped steel frame was designed to allow a certain degree of yield, which enables it to better respond to changes in the road surface and to transmit just the right amount of feedback to the rider. 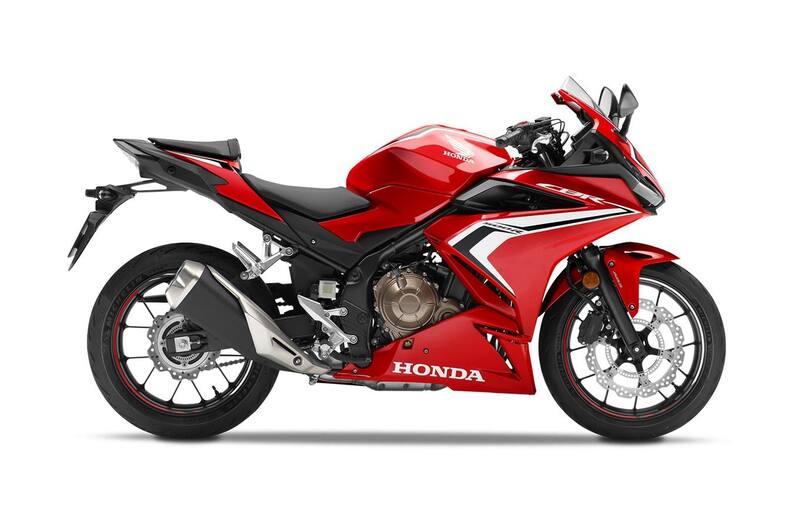 Easy to manage: The 785 mm seat height makes the CBR500R very easy to manage, and its riding position comfortably accommodates riders of any height. Comfortable & sporty ride: Upgraded for 2019, the Pro-Link® rear suspension boasts a new single-tube shock absorber (as found on larger capacity sportbikes) with five-stage spring preload adjustment, replacing the double-tube design of the previous model. Its large-diameter piston ensures excellent suspension response and improved heat dissipation. The shock connects to a rigid box-section steel swingarm with new pressed-steel chain-adjustment end pieces. Both the shock and the adjustable 41 mm fork are calibrated for a comfortable but sporty ride. Excellent manoeuvrability: Lightweight cast aluminum wheels with Y-shaped spokes not only look great, they also contribute to the bike's excellent manoeuvrability. Standard ABS braking: A powerful dual-piston brake caliper up front and a single-piston caliper at the back provide strong but easily controlled stopping power. Plus, the latest two-channel ABS modulators provide more accurate control and improved stability. Reduced unsprung weight: Wave brake rotors with superlative heat-dissipating qualities are lighter than conventional discs of the same diameter, which helps to further reduce the bike's unsprung weight. Sporty riding position: New clip-on handlebars are positioned lower and farther forward, producing a more aggressive seating position that's ideal for sporty riding. Ergonomics were carefully configured to ensure easy manoeuvring in town, an easy reach to the ground, as well as excellent comfort during long-distance highway trips. LED lighting: The CBR500R's sporty fairing and rear section incorporate a pair of bright and distinctive LED headlights plus an LED taillight and turn signals. Bigger fuel tank: It not only looks more aggressive, but the redesigned fuel tank also boasts increased capacity of 17.1 litres, providing a range of approximately 480 km for longer rides and fewer stops. Enhanced comfort: Strategically placed vents and ducts in the front cowl and side panels improve rider comfort and protection while also aiding high-speed handling. 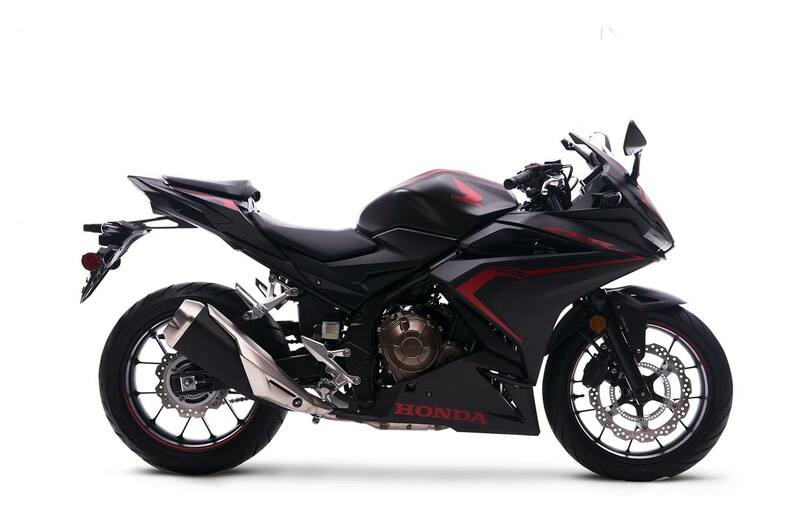 More upgrades: Adjustable brake lever and wave-style ignition key add to the CBR500R's long list of premium features. Convenient storage: A utility space under the seat accommodates a U-lock, wet-weather gear or other items.